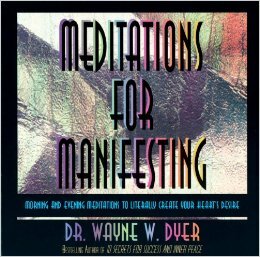 10 years ago in addition to yoga as a regular part of my life I was introduced to Dr. Wayne Dyers Meditations for Manifesting. While I attribute most of my success in life to hard work, smart decisions and being awesome I also like to think that these meditations being a regular part of my life have contributed a good bit to my success. If not for the actual manifesting what I want in life for at least putting me in the right mindset to attain what I want in life and give thanks. I highly recommend you check out the cd set which provides an Ah morning meditation and an Ohm evening meditation. You can find on Youtube the Ah meditation which is a good introduction to the experience.